WR Rashard Higgins, the team’s fifth round pick in 2016. After a productive college career at Colorado State, he underwhelmed after making big expectations for himself his rookie season. He only caught six total passes for 72 yards in the 2016 season and only had 3 catches for 26 yards in the preseason. DB Kai Nacua, the undrafted rookie from BYU. After he left BYU with the fourth most interceptions in school history with 14, he spent training camp and preseason with Cleveland recording seven tackles. He made the initial 53 man roster but was waived on Sunday. DB Darius Hillary who spent the preseason with the Browns and recorded seven tackles. 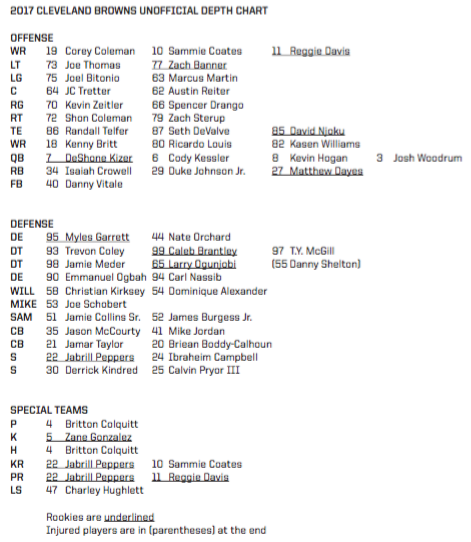 The “unofficial” first depth chart of the regular season was released on Tuesday morning. Cody Kessler is the backup quarterback. I still think his future isn’t too bright in Cleveland. Wouldn’t be surprised if he’s the odd man out in the quarterback room at the end of the week. Danny Shelton still listed as injured but the reports did say he could be out up to six weeks, leaving potentially three weeks left in his recovery time. The glaring depth at the “Mike” linebacker position and in the secondary. I’d expect some roster moves coming by the end of the week. New defensive tackle T.Y. McGill was charged with a misdemeanor possession of marijuana on early Saturday morning. The Charlotte Observer reports that McGill, who was in Charlotte to watch his alma mater NC State play South Carolina was busted outside of a hotel with a “small amount” of marijuana. The Browns claimed McGill on Sunday after he waived by Indianapolis on Saturday. He’s expected in court on October 24 and could face punishment by the NFL for the arrest. Two times this week, the national media has once again decided to take jabs at the Cleveland Browns. Peter King and Bleacher Report both electing to criticize the recent roster moves the team has made: the releases of Joe Haden, John Greco, Brock Osweiler and the trading of Cam Erving. So let me get this straight, the Browns got rid of players who weren’t living up to their contracts or draft status yet the media said we got worse. Message to the national media: if you aren’t paying attention to the Browns, don’t bother giving your opinion on the moves if you don’t have a clue what you’re talking about. I know all the old school football guys want to see the Browns method of building a franchise fail because they aren’t doing it their way. It seems though the Browns way is making it’s way to other teams as you see the New York Jets and the Buffalo Bills “tanking” and stockpiling draft picks much like the Browns have done for the last year and a half.